I hate when people look at their smartphones at dinner. Wouldn’t it be awesome if there was a smartphone app that could help me solve this problem? That logic is the concept behind an app launched this week called DinnerMode, intended to help “break your tech addiction.” The design is extremely straightforward: Users are prompted to choose an amount of time—either 15, 30 or 60 minutes—then DinnerMode tells you to put your phone face down on a flat surface. If you pick your phone up before time expires, you’re given a light chiding. There’s really nothing more to it than that: It doesn’t lock your phone into airplane mode and blacken the screen; instead, it’s just a simple way to be conscious of how often you’re on your phone. First We Feast spoke to Sloane Davidson, the woman behind the idea. She said she was inspired after spending seven weeks on a farm. “When I got back to NYC, my mind went crazy. People were on their phone walking down the street, in the check-out line, at restaurants—literally everywhere,” Davidson said. “I know it’s normal behavior for a lot of people, but after being away for seven weeks I was in a state of shock. And I wasn’t sure I wanted to go back to the way things were.” Apparently, someone doesn’t care who’s winning the Rangers game! 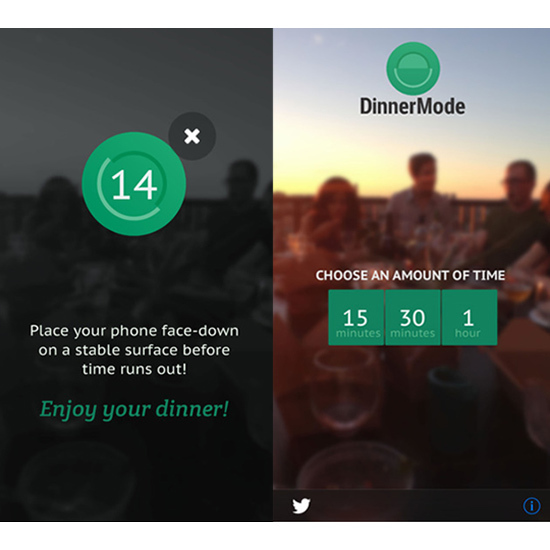 DinnerMode is currently available only for Apple devices. Sorry, Andriod users: You’re just going to have to live with the constant convenience of being on your phone.